We all love to enjoy a good braai in the company of friends and family, where we can celebrate a special occasion or just meet to catch up and share stories. 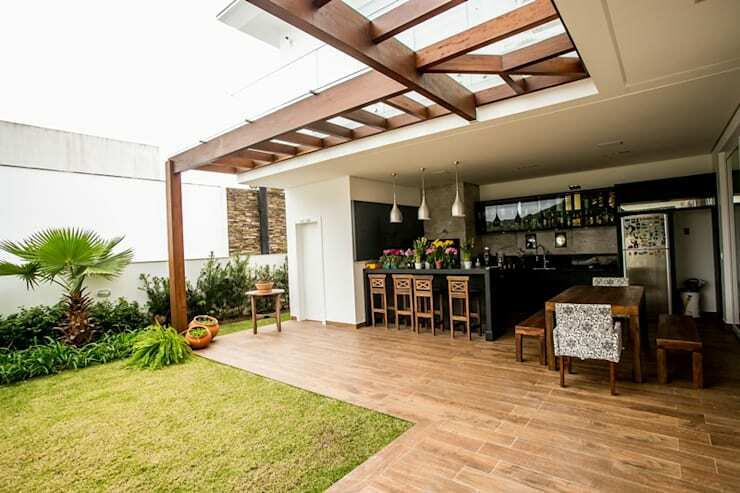 For those who enjoy exploring homify, you'll know how many thousands of designs there are for braais and grills. It can be difficult to know what type to choose! It also can be complicated to figure out what the layout of our braai area will be as well as how this space will work in harmony with the rest of the garden or home. We want to make the most of absolutely every square inch! There is a really easy solution—a bar for the braai area. A bar can create a very social and interactive space, ensuring that the braai master never feels alone while he or she cooks the meat. It can also give this space an extra surface area for preparing food or just relaxing with a glass of wine or a cold beer. 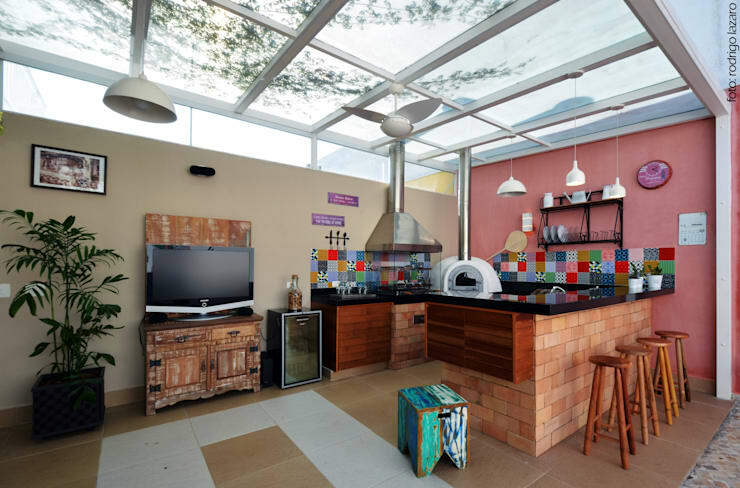 In fact, today we have put together 11 designs of bars around braai's and outdoor kitchens that show they are the perfect tool for merging spaces. What's more is that each of these designs is cost-effective and can work with just about any style. We invite you to explore these savvy and functional bars today and then contact a builder or designer immediately for help creating your very own braai bar in your very own home! Something very important and to keep in mind when it comes to designing a social area with a bar is to have comfortable seating where diners can eat and drink. The traditional design of high stools can be very functional, creating a more casual space for relaxing with a drink or some food. In this design, we can see how the warm wood and the earthy tones create a very cosy and appealing space, converting this place into so much more than a braai area. 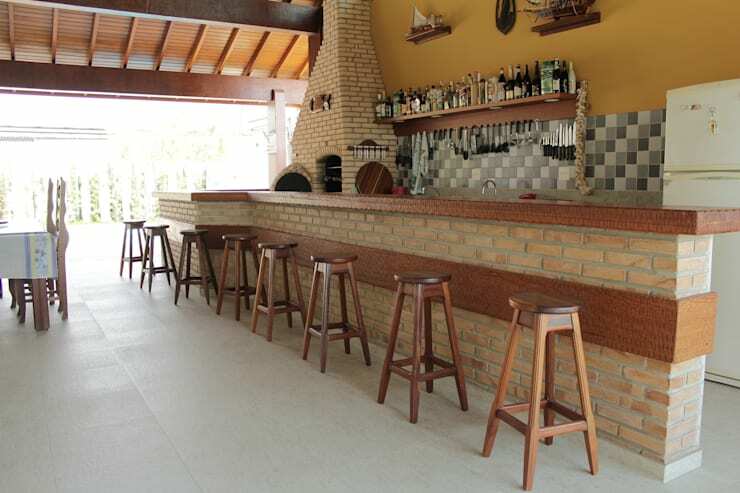 This type of bar breaks up traditional patterns, shapes and distributions with its diagonal lines, which modernise the braai area. This is a great example of visual and spatial fluidity, where every inch of this small area has been utilised. There are plenty of chairs for relaxing and having pleasant conversation as well as a functional braai for cooking food. If you have a large family or enjoy hosting large parties or celebrations, then this is a design that you should look into! 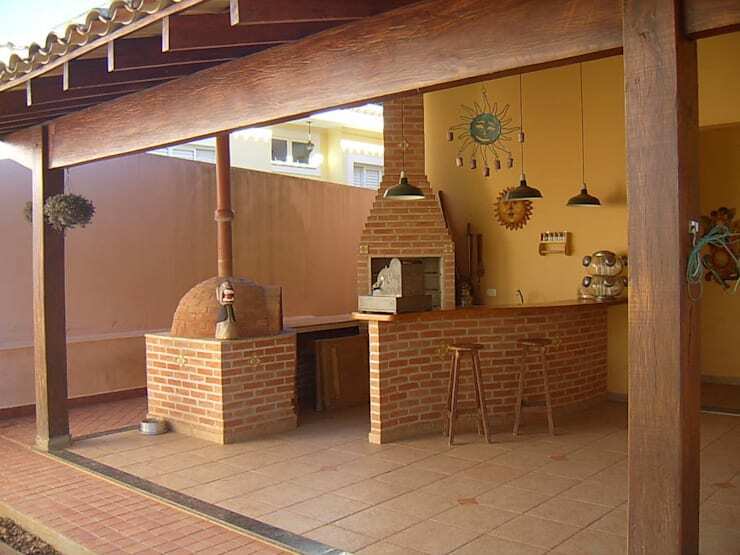 This braai area features a long and extensive bar, made from a mix of materials including brick and wood. This area has ample and comfortable space for hosting lots of guests at one time, while the rustic materials make for an appealing look and feel. Innovation and originality are things that we all look into when it comes to designing our spaces. We want our personalities to shine through in our homes! This applies to the braai area too. If you enjoy a rustic style but would like to give it a little twist, why not incorporate eclectic elements and combine different textures and tones for a more modern and unique finished? Here we can see how mismatched chairs and a diverse range of materials achieve a fresh and charming atmosphere. Modernity and minimalism also have a home when it comes to the braai area. Here we come across a very fresh design with neutral tones and a kitchen island, which really creates a functional and stylish space. 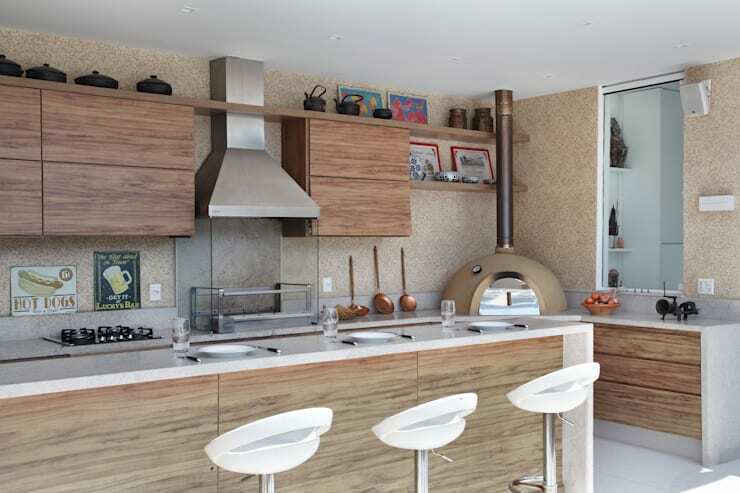 The kitchen island adds storage to this area too, giving the braai master easy access to cutlery and crockery. The cabinets and counters are made with a beautiful light wood, which contrasts beautifully with the white surfaces. The result is a very contemporary space. These colourful and eye-catching tiles are very unique thanks to the myriad of patterns and sizes. They can be used to really transform an outdoor area. 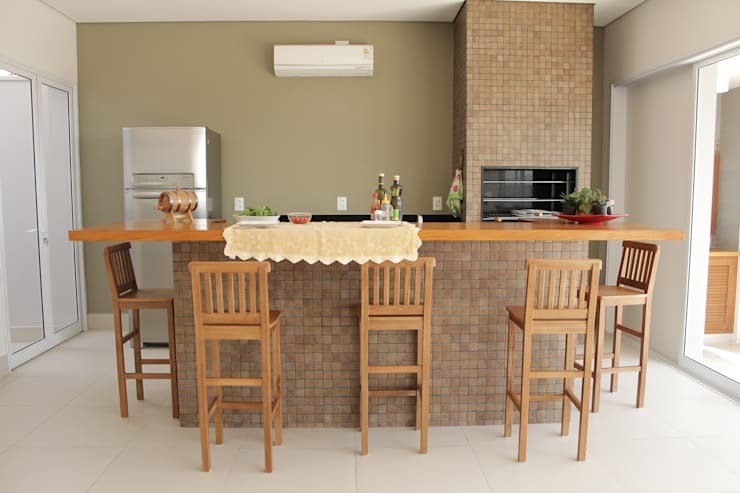 Whether you want to decorate the walls, coat the floors or enhance the counter tops, tiles can be a wonderful budget friendly way to give the braai a fresh and vibrant look and feel. 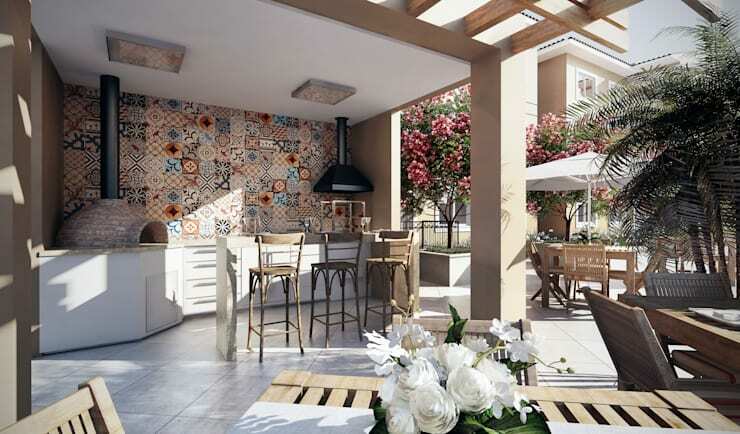 Install some tiles in your braai area and you'll change the style of the space over night! If you have the luxury of an attached braai area in your yard, a bar can be a very simple and practical addition. Ask your bricklayer to advise you on the materials and coatings that you should opt for as well as what the best ways are to reduce costs. You may need to invest in a bar fridge and some comfortable chairs, so keep that in mind. Brick is one of the best materials to use for the outdoor area because it is durable and attractive, as well as cost-effective. 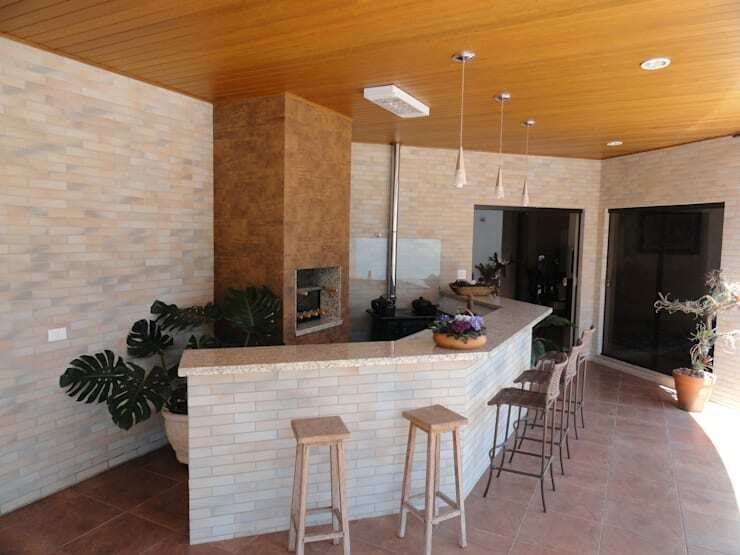 Use a brick wall for the design of both your braai and your bar, creating harmony throughout the design. Once again, you just need to chat to a brick layer about the possibilities. Ask them to help you make the most of space. If you are a fan of sport or really want to entertain your family and friends, why not add an entertainment centre to the braai area? Attach a television to the wall, where you can show the sport or a movie for the kids. With a bar, there will be comfortable places to sit too! In this design, we can see how the colourful walls and tiles make for a very charming and appealing space too! This design merges brick and wood as well as terracotta tiles. The traditional style does not fail when it comes to decor and design and it is timeless, making it a very good investment. If you're a fan of incorporating raw materials in your home for warm and harmonious look and feel, have a look at these tips for making your home roar with raw materials. 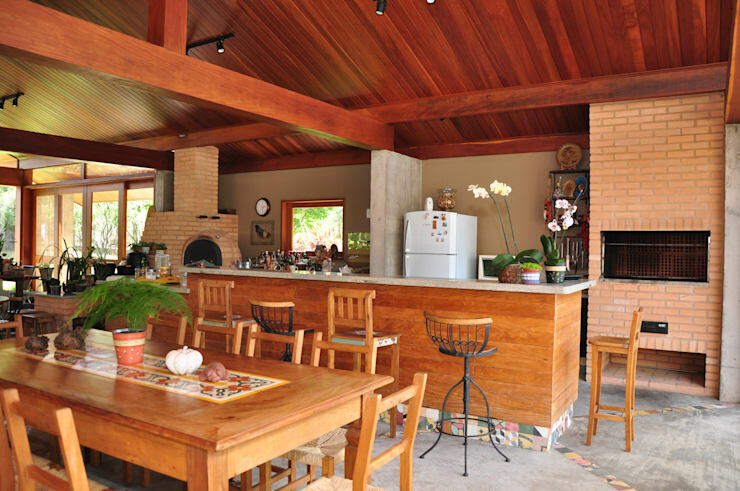 Architects Lucas Lincoln bring us this project that shows just how beautiful rustic style can be. 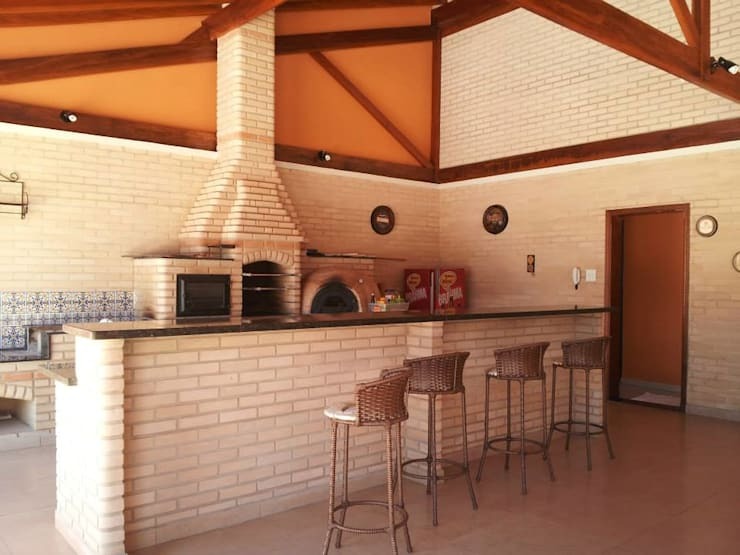 The braai is the focal point of the area, but the bar also plays a very prominent role. There are also plenty of storage spaces, which allow this area of the home to remain neat and tidy, while keeping the equipment, cutlery and crockery easily accessible. Don't you love the detail that the wooden beams introduce to the space? If you've enjoyed this article, you'll love this one too: 14 braais you'll want this summer. Would you built a braai bar for your outdoor area?